One of several chieftaincies in the region at the time of European contact, the Canarsee were part of the Leni-Lenape nation of Algonquian peoples that once occupied much of the northeast coast. The major Canarsee settlement in the area—and a principal council site for the tribes of western Long Island generally—was Keskachauge. It was centered about a crossroads—today's Flatbush Avenue and Kings Highway—on the south rim of a broad expanse of grassland known as the "Great Flats," which extended north to about where Brooklyn College is today. Treeless except for an occasional ancient oak, it was among the few natural prairies east of the Allegheny Mountains, and the source of the name Flatlands. Archeological evidence suggests the Canarsee were only seasonal occupants of this landscape until the arrival of the Europeans. They summered here to fish the waters and harvest oysters and clams. What changed this was the advent of a trade triangle driven by European demand for beaver pelts, which were used to make felt for men's hats. Anglo-Dutch merchants began buying beaver pelts from tribes along the Hudson to sell across the Atlantic at enormous profit. The furs were purchased from the Indians using belts of wampum, tiny tubular beads drilled by hand from seashells. Wampum had long been used for ceremonial purposes by the Algonquians, but now it became valuable legal tender. The Canarsee began manufacturing large quantities of wampum for sale to Dutch and English traders. Once seasonal encampment sites—including the west shore of Gerritsen Creek, Barren Island and Bergen Beach—became major year-round wampum production sites, much to the denigration of traditional tribal lifeways. Keskachauge itself became a busy entrepôt—the "Wall Street of the Indians," as historian Frederick Van Wyck called it. 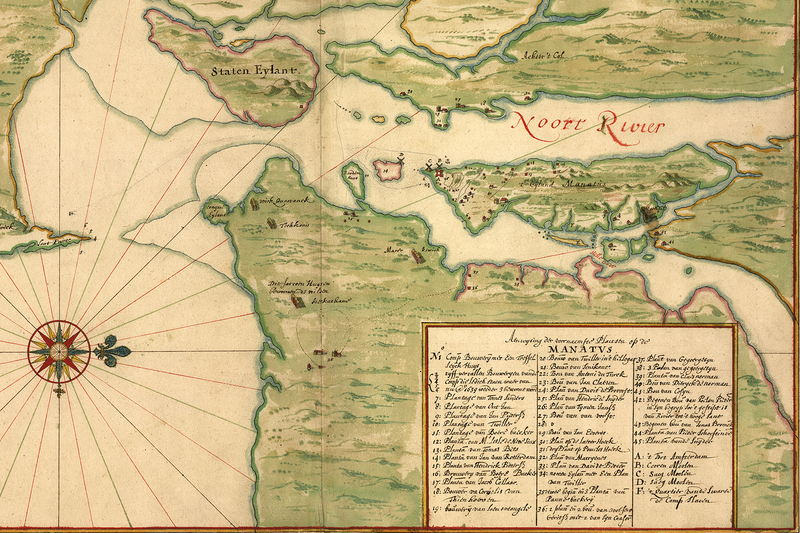 Keskachauge appears on the earliest surviving map of New Netherlands—the remarkable Manatus Map of 1639. It is shown just east of "Conyné Eylant," marked by a longhouse noted as the habitation typical of the "de Wilden Keskachaue"—the natives of Keskachauge. We don't know what this structure looked like—Marine Park's earliest condominium—but it was probably similar to a Canarsee longhouse several miles west at New Utrecht, described in 1679 by Jasper Danckaerts and Peter Sluyter as "low and long, about sixty feet long and fourteen or fifteen feet wide. The bottom was earth, the sides and roof were made of reed and the bark of chestnut trees; the posts, or columns, were limbs of trees stuck in the ground, and all fastened together." The Canarsee Indians, occupants of Brooklyn for untold centuries, did not survive the onslaught of European colonization. Warfare with the Dutch took its toll, but disease was far more devastating. The bacterial isolation of the Americas made its native peoples highly vulnerable to a range of European maladies—smallpox, influenza, cholera, diphtheria, bubonic plague. The Indian population rapidly declined, and was but a memory even before the end of the 17th century. Keskachauge was deserted as early as 1640, at the outbreak of the bloody Governor Kieft War. It was revived as a small Dutch village known as Nieuw Amersfoort. With the ascendency of English rule in 1664, Nieuw Amersfoort became the town of Flatlands, center of a remote farming community that would undergo little change for the next 200 years.